Now is the perfect chance to share a filling and comforting meal with everyone. 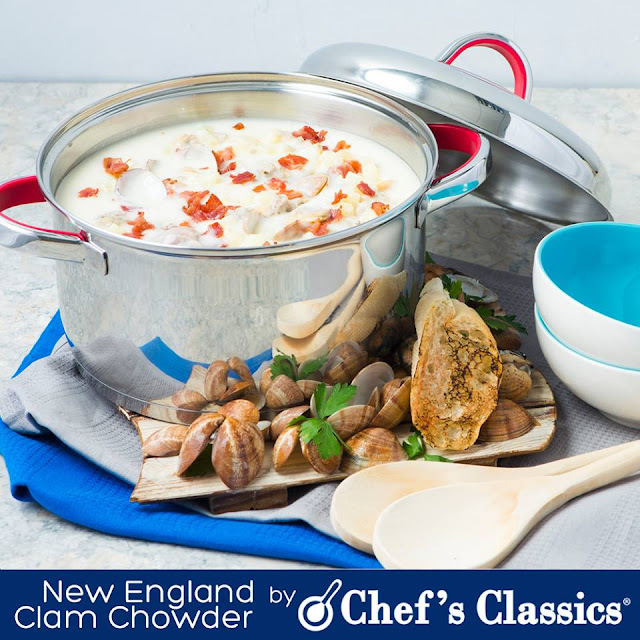 Whip up this delicious New England Clam Chowder, and serve with bread or salad. If your household is not familiar with Clam Chowder, then take this opportunity to introduce them to this rich soup. 1. In your Chefs' Classics Ashley Sauce Pot, render bacon over medium heat. 2. Add chopped onion and cook slowly until it's soft. 3. Mix the flour and cook for 3 to 5 minutes. 4. Slowly stir the clam liquid with a Chefs' Classics wire whip. 5. Bring to a boil but make sure the liquid is smooth by stirring constantly. 6. Add the potato with the mix. 7. Simmer until potatoes are tender. 8. Stir in the milk, cream and clams. 10. Add seasoning like salt and white pepper.